Raphael Ohrchaim Fulcher is no ordinary rapper. Better known to his You Tube Fans as HEBRO, he gave a performance on February 28 in Rockland Community College, the last day of Black History Month and helped to usher in Jewish Heritage Month, which began March 1. The Crown Heights native’s parents converted to Orthodox Judaism, and Fulcher has kept the faith, bringing his “peace” rap music style to the campus on February 28. 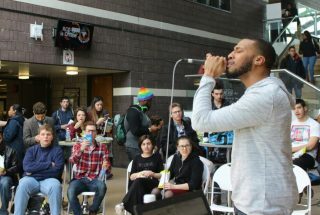 “King David was probably the best ‘rapper’ in history,” said Fulcher before performing before students of all faiths in the Cultural Arts Center.